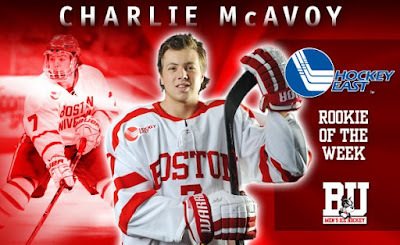 Freshman Charlie McAvoy was named Hockey East’s Pro Ambitions Rookie of the Week following a four-assist, +5 performance in the two-game sweep of UMass. The right-shot defenseman is the third Terrier to win top rookie honors this season and the first BU blueliner to record four assists in a game since Matt Gilroy in the 2009 NCAA regional vs. Ohio State. Jakob Forsbacka Karlsson was selected in November and Jordan Greenway was R-O-W twice last month. Senior assistant captain Danny O’Regan and freshman Bobo Carpenter were named to the list of weekly top performers. 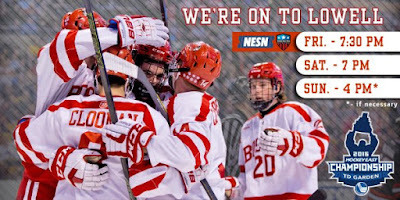 In both the USCHO and USA Today/USA Hockey Magazine polls, BU moved up a notch to # 8, jumping over Michigan. 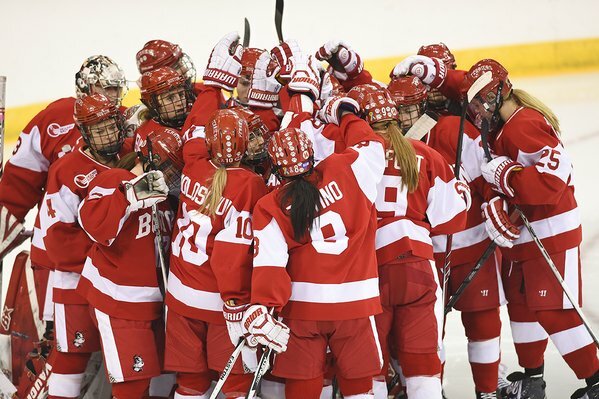 Terriers are tied with the Wolverines for the eighth spot in the PairWise rankings. #8 BU begins its best-of-three quarterfinal series against Lowell with game times shown above. Friday night's game will air in New England on NESN and nationally on the American Sports Network. 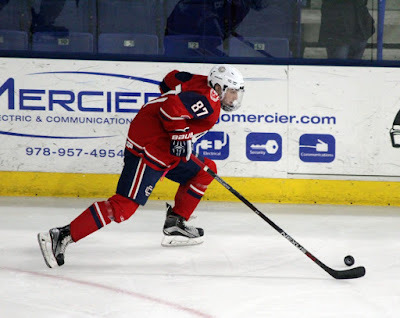 The Terriers and River Hawks split the season series last month with each team winning on its home ice. Episode 4 of BU Hockey All Access will air on NESN just prior to Friday night's game. 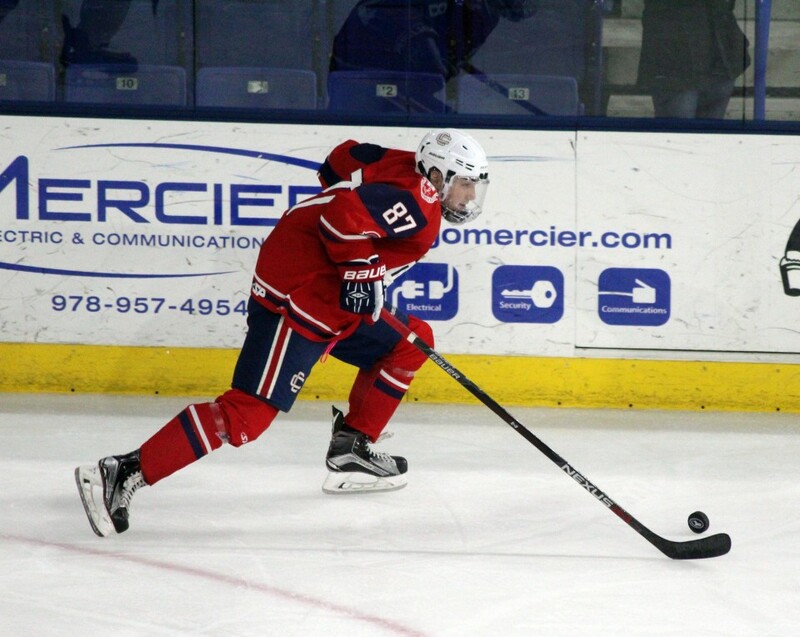 In the NEPSAC large school championship game, Thayer Academy, coached by former Terrier standout, NHL star and Olympian Tony Amonte, defeated the Westminster School, 6-3. 2017 recruit Ty Amonte finished the season with 70 points in 30 games for Thayer. 2016 recruit Johnny McDermott scored 36 points in 24 games this year for Westminster. St. Mark’s, coached by former BU captain Carl Corazzini, won the small school final, edging The Rivers School, coached by former BU All-American, NHL Stanley Cup winner and Olympian Shawn McEachern. Corazzini is in his second season at St. Mark’s, having succeeded current BU assistant coach Scott Young. 2017 recruit Patrick Harper finished his prep season with 59 points in 27 games. Avon Old Farms lost in the Elite Tournament semifinals to Gunnery, despite a highlight reel goal by Harper. 2018 recruit Jake Wise scored a goal and added an assist as Central Catholic came from behind to upset top-ranked BC High, 4-3, in the Mass. Super 8 tournament. Nick Bonino broke a long scoring drought with a goal and an assist in Pittsburgh’s 6-1 win against New Jersey. Terriers’ attempt to win a fifth consecutive Hockey East title was derailed in the championship game as undefeated BC took a dominating 5-0 win. BU finishes the season with a 23-14-2 overall record and an 18-5-2 conference record. Sophomore Rebecca Leslie and Victoria Bach led the Terriers in scoring with 49 and 48 points respectively and Bach was the top goal-scorer with 22. Three seniors contributed 30 or more points: Rebecca Russo (38), Sarah Lefort (35) and Kayla Tutino (30).